Enjoy 20 different bulk gummies including dinosaurs, centipedes and giant snakes, four Jelly Belly flavors and six delicious chocolate covered bulk varieties in a colorful and flavorful old time candy shop. A tempting selection of 16 hand-dipped House of Flavors ice creams. 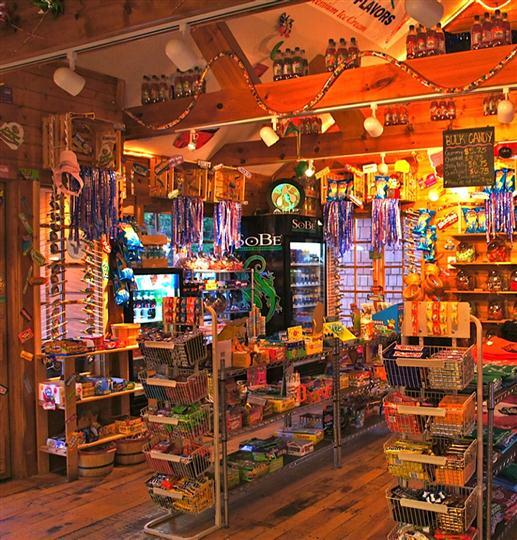 Novelty ice cream bars, licorice ropes, colorful unicorn and whirly lollipops, a huge selection of candy bars, Wonka candies, non-alcoholic beverages and our own Boonedocks logowear of t-shirts and sweatshirts. Sleeping Bear Sweets was founded in the summer of 1998. We are open daily from Memorial Day until Labor Day and weekends through the fall color season.